It may be implied that a carrier can fly with a minimum crew of 1. All it really does is command robotic interceptors. A carrier on an expedition might have as much as 100 in its crew. Also, a crew complement isn't necessary for barebones operation - it probably includes marines, chefs, equipment servicers, janitors, and the like. The primary, necessary crew occupies the bridge and engineering. Mostly it involves stooping over consoles and technician stuff (technicians mostly work with getting computers operating smoothly; they're necessary since terran computer software and hardware always has some sort of flaw). Other crew include SCV operators that touch up the inner-hulls, that on other occassions are most likely just error boys and ensigns that look after passengers. There's probably a lot of barebones battlecruisers lying around in the dominion - they're basically rusty semi-ghost ships, whom's crew touches the bridge and avoids everything else (lots of dark, dirty vacant hulls - probably with some dead prisoners). The dominion is a vast bureacracy that has enough trouble as it is with records whenever the emperor doesn't veto something or insert 'word of god'. Terran computers are made to be reliable. They aren't big business and there are many flawed perceptions about the necessity of computers, however. Computers, while necessary, are a victim of bureacracy - treated like an afterthought. Even so, computers exist in pretty much everything. Despite this, guided weapons aren't very popular beyond the most reliable and proven (ie. hellfire missiles; which have probably been held back from the market, amid all the kel morian combine feuding for product certification). Anything innovative that arrives will have all its sources swallowed up by the war machine of the nearest faction. So innovation is briefly tested, veto'd by some friend of more powerful competition, forgotten, and the brains are forced to work on something else since they won't have any funding and there ideas will be considered property of some other subsidiary that sits still. Things were a bit different during the confederacy - but back then, there was a much more severe class distinction. Big business monopolized certain areas of trade so that a new and innovative product had a lot more trouble getting around. Law was mighty but it was difficult to tell if who was going to pick up your package was that corporate control sphere in system X that could invade your home at any minute. Corporate assets were tracked with top government surveillance tools, so anything new that a corporation got their hands on would need to be destroyed and all evidence removed or they would get fined for theft (a scaling price derived from company networth - so effectively enough to set a monopoly far enough back that another business could usurp them; such companies didn't take any risks, and were resultantly quite abusive). Many regions stagnated because of this. Inevitably, pirates and other self-sufficient rogues (included mercenaries, which were considered criminal and terrorist for having more than one allegiance) were among the most innovative with whatever limited funds they had. Paranoia grew, with people trying to get away and forming their own enclaves (in space, or planetary). Government reacted with more paranoia itself. Inevitably, the only truly innovative things were created by the government itself - usually to further its own goals. The government behaved imperialistically while limiting the imperialism of other corporations, and even the wealthy hated them for it (except that they could be ordered to death by a member of the old family, which typically supported absolute privacy-invasion and government imperialism). The confederacy was not facist - because the old families could disagree on some things, and weren't always in it for the 'greater good'. It wasn't authoritarian. You could disagree with the government, as long as you didn't insult a member of the old families, or violate any serious laws. But it was imperialist and it would do whatever it could to uphold its laws. Mengsk basically turned it around - the wealthy liked the dominion's government for allowing them to run their own affairs and for essentially having a partnership with the dominion military sphere - as opposed to the adhering to the military in all matters; things were similar except that some organizations could get favors if they supported the dominion enough; supporting the confederacy didn't get you any favors except the price they offered you - some companies could negotiate a larger price when the confederacy really wanted something - this went with the exception that only the emperor would have the final say. They were actually satisfied with only having to avoid stepping on one man's toes instead of multiple people with different opinions. The dominion is aware of many problems within its territory, but it can't deal with them all at once. That's why places like 'Dead man's Rock' exist. The dominion is closest to a clumsy fascist state, whereas the confederacy is more oligarchical semi-kleptocracy/semi-communist (originally minarchist). The confederacy didn't steal everything (some old family members would have wanted people to have their own affairs, and there was also the senate), and it only sorta operated on a union of everyone policy. Notice the lack of utterly massive, multi-national corporate ad-banners above, whereas the 'metalopolis' map has fictional-ads everywhere (ie. ipistol, a parody of the major ipod brand, suggesting the persistence of big business coming out of the shadows). So it's pretty clear that a fundamental shift occured with the dominion becoming the global power. If the confederacy had corporations beyond merchants, paranoid consumer manufacturers, and prospectors, they were defense contractors that the government developed a long history of trust with (such as CMC), or old family sponsorees. It's similar to how big business in russia grew literally over night after the fall of the soviet union - of course, that occured when certain essential resources (natural gas, etc.) became privatized (the 'russian oligarchs'). But since the population of the dominion numbers the billions instead of the millions, even non-essential resource business could have grown overnight (or at least after korhal became residence to millions of immigrants). The above are just my opinions. Last edited by solidsamurai; 10-16-2011 at 07:34 PM. Yeah, I think they're too small for cerebrates, but they're too big for larvae, you can see little human skulls in the room. So, uh, yeah, I've just assumed that they're either a part of the hive or some unnamed unit that lives inside of it. Yeah, I support Protoss ships having minimal crews, because they can clearly make robotic flyers and they warp all their soldiers and units in from other planets. But I would imagine that carriers' hulls would be filled with shuttles and scouts in addition to their interceptors, and would also have space to house dozens of reavers and hundreds of Protoss. After an army had already been warped in, it would make sense for the massive carriers to have the capabilities to carry and redeploy the troops, even if when they're empty when they're warped in themselves. Similarly, I imagine Battlecruisers being pretty huge, each carrying enough to start a new terran expansion, with tons of minerals, scvs, several dropships, and space for tanks and troops. Plus the bigger ones would have a nuclear silo to launch the orbital nukes that ghosts use on top of the reactors that power their own engines. That all makes behemoth battlecruisers pretty huge. I can tell you guys are pretty fixated on capital ships; I'll try to get to them soon! Here's about what I'll guess for the carrier/battlecruiser size, but we'll see how big I estimate the battlecruiser to be soon. The author depicts Immortals and Dragoons a bit smaller than I think they realistically be; there's no way you'd be able to fit a Protoss torso into either. So I spent a while looking for that artwork of the Immortal shell. Turns out the original source web site went down a while back, so I had to dig through an old hard drive of mine to finally get it and convert it to .jpg format. EDIT Had to upload to my deviantArt account. Here we are. Last edited by Visions of Khas; 10-19-2011 at 11:56 AM. Wow, that shows the size pretty definitively. 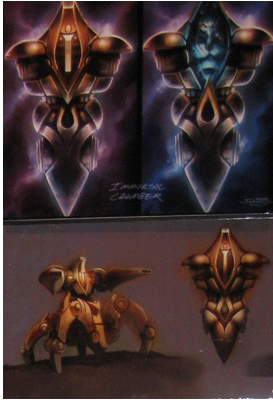 It's a little strange though; if the Protoss torso is up inside the immortal's chest/head turret piece, where were they in the original dragoons? I mean, there's still room inside the base, but it's a little strange. Still, thanks a ton for digging up that image. I have no idea. I've always imagined them as being curled up. Some hypothesize that their legs are cut away so they'll fit, but I personally doubt it. Even so, the head and torso, at the very least, are retained. I believe protoss vital organs are suspended on the blue liquid from the old dragoons. They were removed from the torso and the head was inside this chamber as well, but conected the the rest of the biomecanic equipment. Reduced the necessary space. There's a pre-rendered battle sequence with lings, hydras, banelings and ultralisks in Heart of the Swarm. I swore out lout and cried tears of happiness. Last edited by drakolobo; 10-21-2011 at 10:48 PM.